Immediately I thought of all the people I know and met there. Since the earthquake, I have been in contact with those who were the most closest to me and everyone is alright, thankfully. I still think of those who I met throughout my experience that affected me in some way that I am not in contact with... all the children at Liceo Pedro Montt and their families, my professors, people I talked with on the street and those we met while traveling around and I hope that they are all okay, as well. As Alexis told me "Tu sabes que los chilenos nos caracterizamos por levantarnos cada ves que nos caemos..." (you know that Chileans, we characterize ourselves by standing up each time we fall...) Vamos Chile! 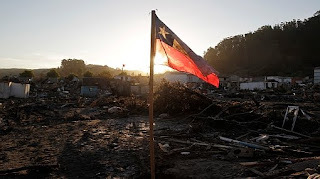 FUERZA CHILE.